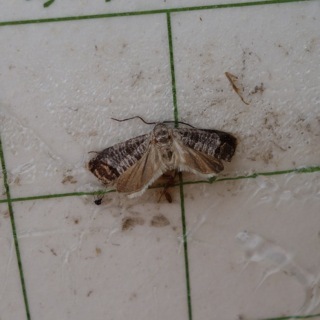 Codling moth (CM) -- 1st generation, first sustained trap catch biofix date: May 20, Tuesday. Codling moth development as of June 9: 1st adult emergence at 45% and 1st generation egg hatch at 1%. In most orchards, insecticide targetted against plum curculio and apple maggot prevent codling moth damage. If targetted codling moth control is needed, key management dates are shown here: 1st generation 3% CM egg hatch: June 10, Tuesday = target date for first spray where multiple sprays needed to control 1st generation CM. 1st gerneration 20% CM egg hatch: June 16, Monday = target date where one spray needed to control 1st generation CM. Oriental fruit moth (OFM) -- 1st generation OFM flight starts: May 9, Friday; 1st generation 55% egg hatch and first treatment date, if needed: June 2, Monday. 2nd generation OFM flight begins around: July 1, Tuesday. Plum curculio (PC) -- Increase risk of PC damage as McIntosh and similar cultivars increase fruit size: May 26, Monday; Earliest safe date for last PC insecticide spray: June 11, Wednesday. If relying by repellence by Surround instead of PC mortality by insecticide, Surround coverage should be maintained until PC egglaying begins to decline naturally around Tuesday, July 1. Spotted tentiform leafminer (STLM) -- 1st STLM flight, peak trap catch: May 16, Friday. 1st generation sapfeeding mines start showing: May 24, Saturday. Optimum sample date is around Monday, May 26, when a larger portion of the mines are visible. 2nd STLM flight begins around June 19: Thursday. 2nd STLM flight begins around June 19, Thursday. Rough guess of when 2nd generation sap-feeding mines begins showing: July 8, Tuesday. It almost seems like it is quieting down a bit. Primary apple scab season is over. 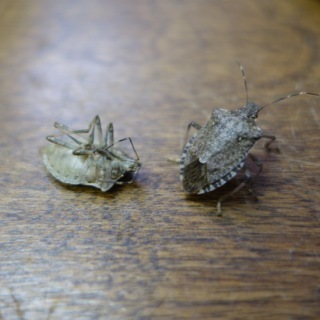 Plum curculio sprays have been applied, maybe you will need one more? Chemical thinners have been applied to apples, now we are waiting for the results to determine how much hand-thinning remains. Fertilizer has been applied, although there may be room for another nitrogen application before July 1. It's been wet enough, but barely -- young orchards for sure need water. What's on the horizon? Begin hand-thinning of peaches (what remains) as soon as practicable. Obliquebanded leafroller (OBLR) pheromone traps should be up, and orchards with a perpetual problem with OBLR will be spraying for it at the end of this month. Burr-knots in dwarf apple blocks are susceptible to dogwood borer infestation, and now is a good time to apply a trunk spray of Lorsban as adults are flying and beginning to lay eggs. Apple scab lesions are clear in unsprayed McIntosh. These were likely from major primary infection period May 15-16. 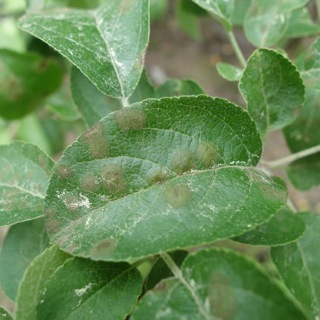 Needless to say, if you find scab in your orchard now, you need to keep applying fungicide(s). Codling moth (CM) pheromone trap catches have been consistent at the UMass Orchard, beginning in late May with a biofix, and a bit of a peak sometime last week. 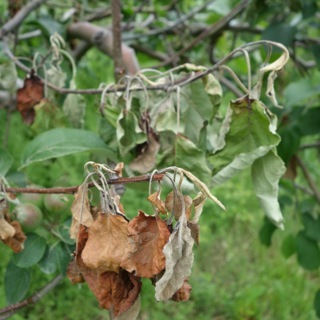 Insecticide sprays for curculio generally help take care of CM, but some orchards need to specifically treat for CM -- the timing appears to be sometime next week for this insecticide application. Consult the 2014 New England Tree Fruit Management Guide for specific insecticide recommendations (there are many). Fruit continue to increase in size. In blocks that I visited yesterday fruit size ranged from 16 to 19 mm. This means that the effective chemical thinning season for 2014 has just about come to an end. Thinning sprays that went on last week appear to be working. The weather for the week is forecast to be unsettled with the possibility of rain nearly every day. Given that thinners effects are starting to manifest themselves it is prudent to wait now until you can get a clearer picture before making any other thinning decisions. 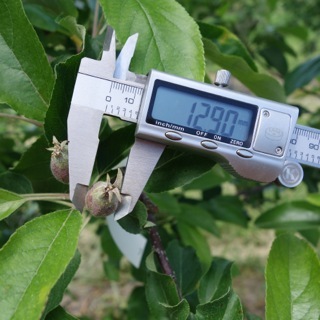 The primary option growers have when fruit size is 20 mm or more is ethephon plus carbaryl. This is a last resort option. Assess set this weekend and then make the decision at the end of the weekend if further chemical thing is necessary or appropriate. The next Healthy Fruit will be published on Tuesday, June 17 or thereabouts, 2014. As always feel free to get in touch with any member of the UMass Fruit Team (http://extension.umass.edu/fruitadvisor/team-members) if you have questions or comments.